The Scan Man enjoyed a visit to the Gulf Coast of Florida last week. After we left, Tropical Storm Debby hit with up to 15 inches of rain in some places. While most people are well protected from the wind, very few are well protected from the water. Please remember to scan your vital records if you are storing the originals anywhere near or below grade. Tropical Storm Debby churned slowly toward the U.S. Gulf Coast on Sunday with 50 mph (30 kph) winds and was expected to strengthen into a hurricane as it skirted the Louisiana coast and took aim at Texas, the U.S. National Hurricane Center said. Debby was centered about 165 miles (265 km) southeast of the mouth of the Mississippi River and was moving slowly northward at around 3 mph (5 kph). The storm was expected to strengthen into a hurricane by Tuesday night. 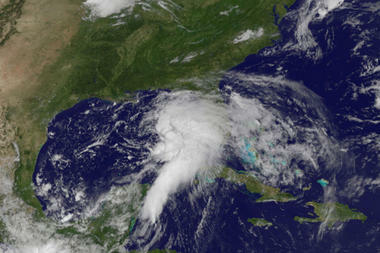 Debby was forecast to turn west, grazing the Louisiana coast through Tuesday and slamming into Texas late in the week. Oil and gas producers evacuated workers from platforms and shut in production on Saturday as the weather worsened in the Gulf of Mexico, which is home to 20 percent of U.S. oil production and 6 percent of natural gas output. he agency’s next update was expected at midday on Sunday. A tropical storm warning was issued for the Louisiana coast from the Pearl River west to Morgan City, excluding the city of New Orleans and Lake Pontchartrain. Residents were warned to expect storm conditions within 36 hours. “Tropical storm conditions are expected to first reach the coast within the warning area by tonight, making outside preparations difficult or dangerous,” the forecasters warned. The combination of storm surge and high tide could cause flooding in normally dry areas near the Louisiana coast, they said. Debby could bring 3 to 6 inches (8 to 15 cm) of rain to the Gulf Coast from southern Louisiana to the Florida Panhandle, with up to 10 inches (25 cm) of rain in isolated areas. The heaviest squalls were hitting Florida‘s Gulf Coast, where there were unconfirmed reports that a tornado had touched down on Saturday. Several Alabama beaches were closed due to rough surf. Forecasting models still diverged on the storm’s potential path. Most swung it west toward Texas or Louisiana, but a few still took it east toward Florida. The U.S. Bureau of Safety and Environmental Enforcement, which oversees oil and gas activity in the Gulf, said earlier on Saturday that 7.8 percent of daily oil output and 8.16 percent of daily natural gas output were shut down.